Mr. Valentino and Mr. Giammetti often sit front row at Maison Valentino shows. But their presence was especially appropriate at this month’s Valentino Sala Bianca 945 haute couture show in New York, inasmuch as the clothes paid explicit homage to the earliest Valentino collections. On December 10th, current house creative directors Maria Grazia Chiuri and Pierpaolo Piccioli took over the Marcel Breuer-designed building at 945 Madison Avenue that once housed the Whitney Museum, gathered fashion’s great and good for the occasion, and sent out a special, one-off couture collection all in shades of white. 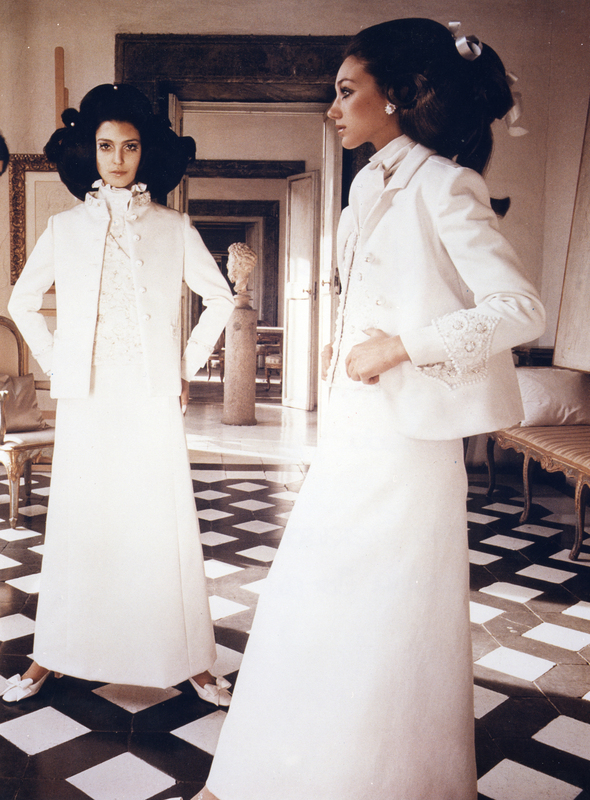 The all-white theme was wink at the house’s history, given that two of Mr. Valentino’s most important shows, at the start of his career, were at the Sala Bianca in Florence in 1962, and the Sfilata Bianca in Rome in 1968. Mr. Valentino described the Sfilata Bianca show as a “non-color” show. Meanwhile, in the same decade, painter Robert Ryman was developing his vocabulary of all-white paintings, and Marcel Breuer inaugurating his “non-color” Whitney Museum building. (Even the location of this show was an homage!) If the palette was one kind of nod to the sixties epoch of Valentino, the silhouettes were another—exquisite lace shifts, trim safari suits, patchwork crocodile A-line coats, goddess pleat gowns and cape-backed, floor-length sheaths. You could sense Jackie O’s spirit in the room, hovering. Indeed, she famously wore a dress from 1968 Sfilata Bianca collection for her wedding to Aristotle Onassis that same year. Chiuri and Piccioli tipped their hat to the Sfilata Bianca collection in one other way: That was the first Valentino collection to find Mr. Valentino using his monogram as a graphic device, abstracting it into prints and patterns that gave an architectural rhythm to the clothes. Chiuri and Piccioli repeated that graphic use of the monogram, in looks such as a felted wool coat and mini-dress patterned in the iconic double-V. Looks from 1968 – like a gold-toned mini-dress in double-V brocade, would have fit snugly into their new collection. Meanwhile, Mr. Giammetti and Mr. Valentino looked on, approvingly. They were joined in that by seatmates Anna Wintour, Franca Sozzani, Sofia Coppola, Karolina Kurkova, Olivia Munn and Katie Holmes. Given the stars’ reaction to the Sala Bianca 945 collection, we can all expect to see a lot of white on the red carpet this awards season.